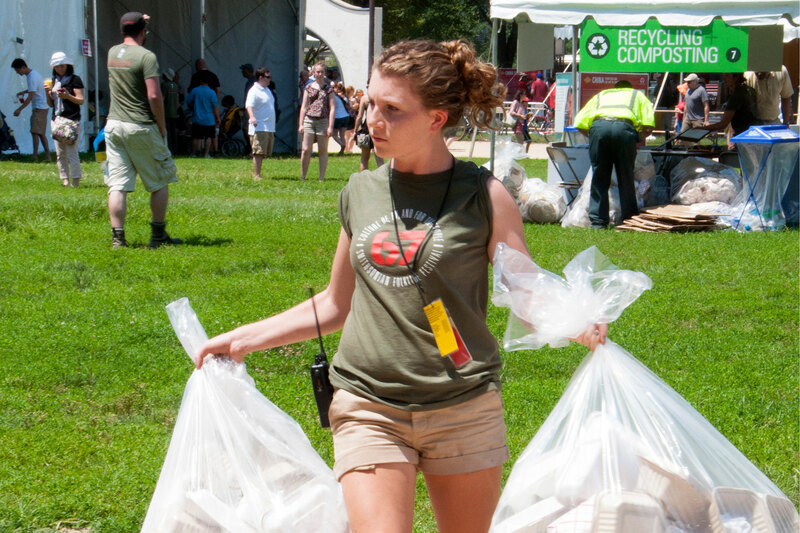 For the past two summers, facility management intern Sarah Gaines of the University of Toronto has assisted the Smithsonian Facilities Management Team and Folklife in how to make the festival a more sustainable event. 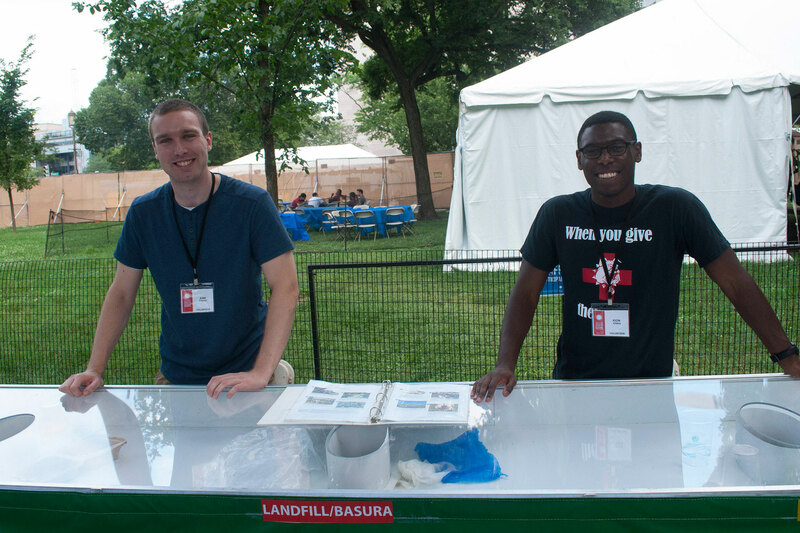 Along with documenting and reporting progress, Facility Management Interns play a key role in volunteering to operate Resource Recovery Stations which are not only responsible for collecting waste, but educating the public about composting and other sustainable practices. Two of the following statements are true, but one of them is not. Can you guess which is which? a) Clear cups can be composted. 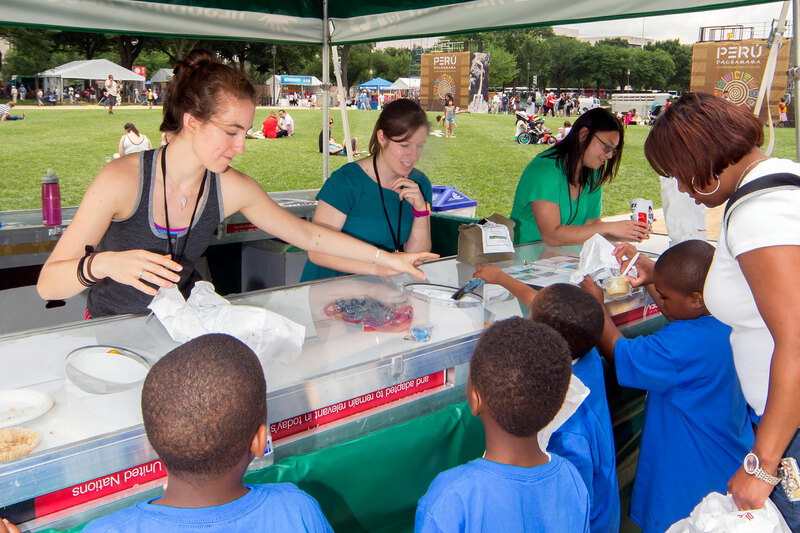 b) The Smithsonian Folklife festival is the greenest event on the National Mall. c) Society’s consumption habits make it impossible to change the way people think about trash. The first two statements are astonishingly true! The third represents a common misconception that the Folklife Festival’s sustainability initiative works to disprove. By sharing our practices with the hundreds of thousands of annual visitors, the Festival encourages the public to think of waste as a recoverable resource rather than garbage to be burned or buried. It begins with corn cups. Before food vendors can be part of the Festival, they have to agree to use 100% compostable serving ware only. That means that this year’s visitors sipped their delicious fruit smoothies and Pisco sours out of cups made of polylactic acid (PLA). PLA looks and feels like clear plastic but is actually derived from corn starch. These cups—along with PLA utensils, to-go containers made of bagasse (plant pulp) or paper, paper napkins, and food leftovers—can be diverted from the landfill and made into a nutrient-rich soil supplement, commonly known as “compost.” Maryland Environmental Service’s Western Branch facility runs a pilot food waste composting program, which uses advanced GORE© cover technology to break down organics into certified compost in just 8 weeks. 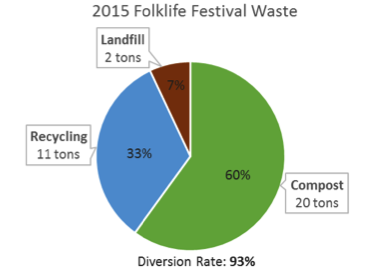 Over the course of the two-week Festival, we achieved a total landfill diversion rate of 93% for the second year running! 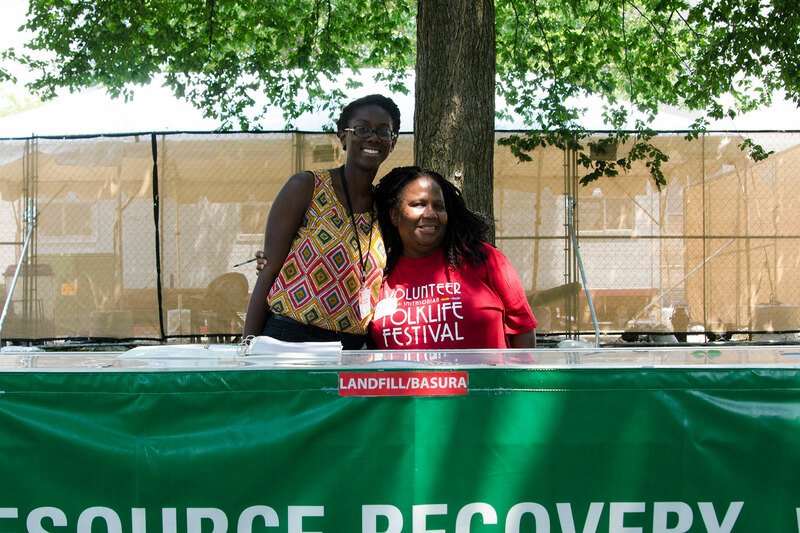 That means that only 7% of Festival waste wound up in a landfill, while the rest was composted or recycled. 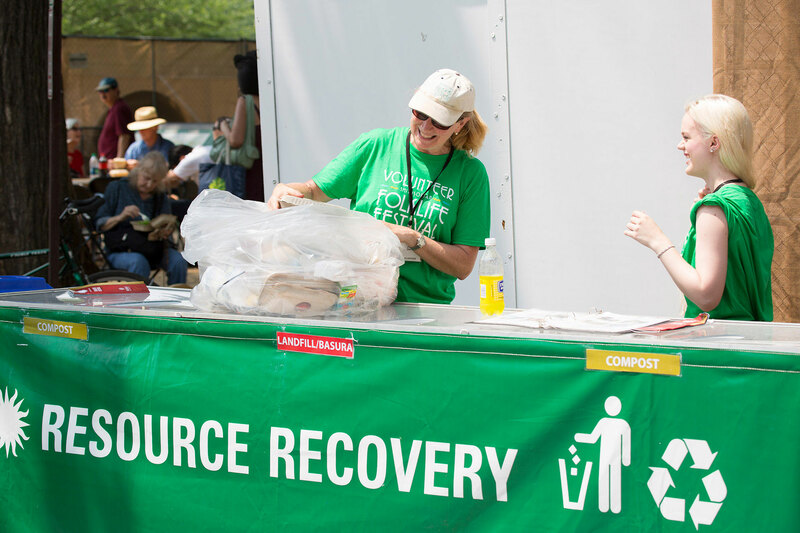 The Festival relies on passionate, educated sustainability volunteers to engage the public and help promote recycling and composting efforts, collecting and sorting waste at resource recovery stations. Visitors were often surprised to learn that materials they thought needed to be thrown away (like utensils and cups) were instead going to be used for a productive purpose! We kept educational binders at each station to explain the recycling and composting processes, as well as a sample of finished compost to show the public what their waste materials would become. In addition to materials from the visitors, the food vendors’ kitchens also contributed a significant volume of waste. We worked with the staff to separate their organic food scraps from plastics. With their cooperation, we also recycled tons of glass beer bottles. 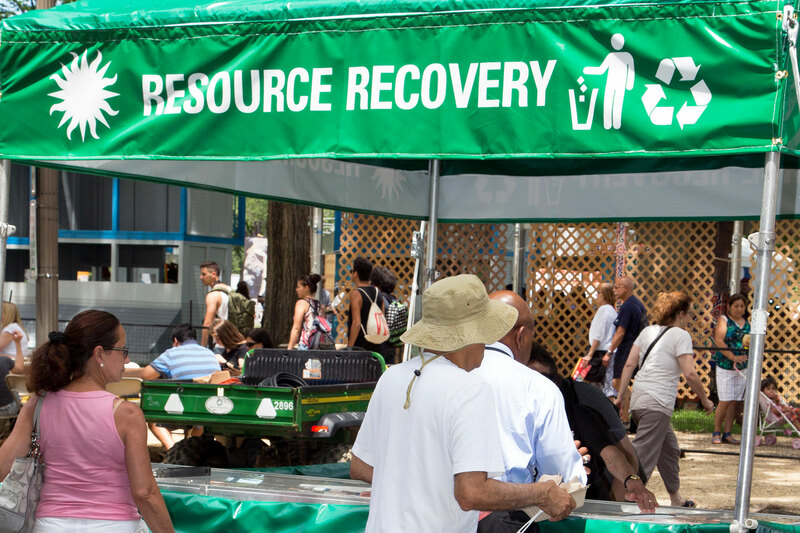 Although waste diversion is our proudest achievement, the Festival has many other remarkable sustainability initiatives. We provide free water stations to encourage visitors to bring their own refillable water bottles, and promote the use of public transit and biking to travel to and from the Mall. Our generators and vehicles run on a B20 biofuel blend, and the used cooking oil from kitchens is recycled to make similar biofuel. 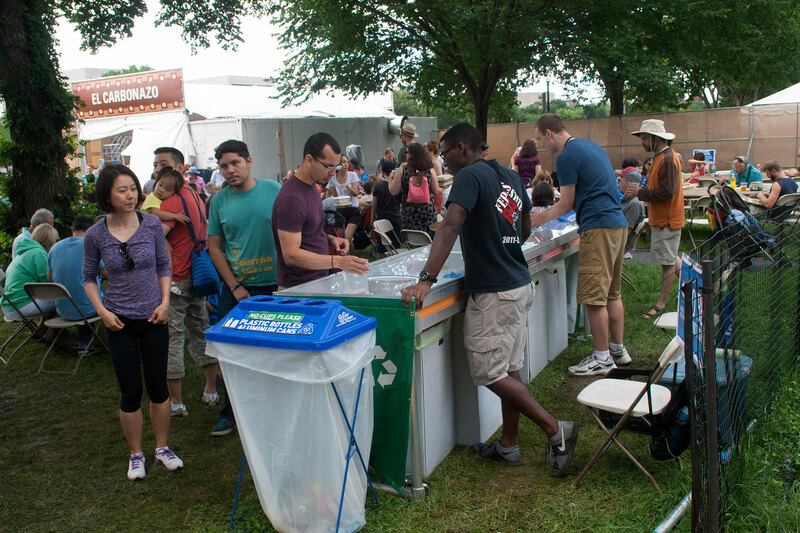 The Festival is dedicated to reuse, donation, or recycling whenever possible. The Festival Marketplace sells tote bags made from banners and signs from past festivals. This year, the Q’eswachaka rope bridge built by Peruvian participants on the Mall was donated to the National Museum of the American Indian (you can see it at their exhibition The Great Inka Road: Engineering an Empire). We also donated usable construction materials to Community Forklift, a nonprofit reuse center for home improvement supplies, and recycled the remaining construction debris. 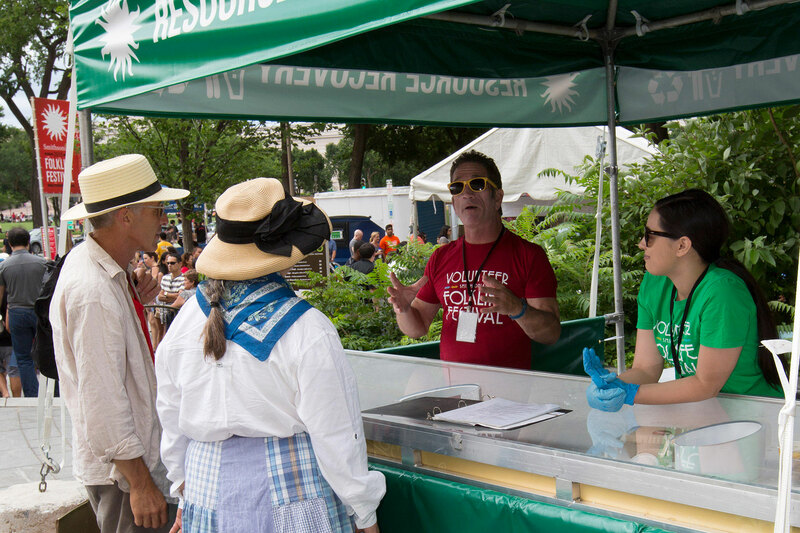 Our Festival sustainability team hopes to spread the knowledge we have developed and inspire other festivals, institutions, and even individuals to explore more sustainable practices for their special events.